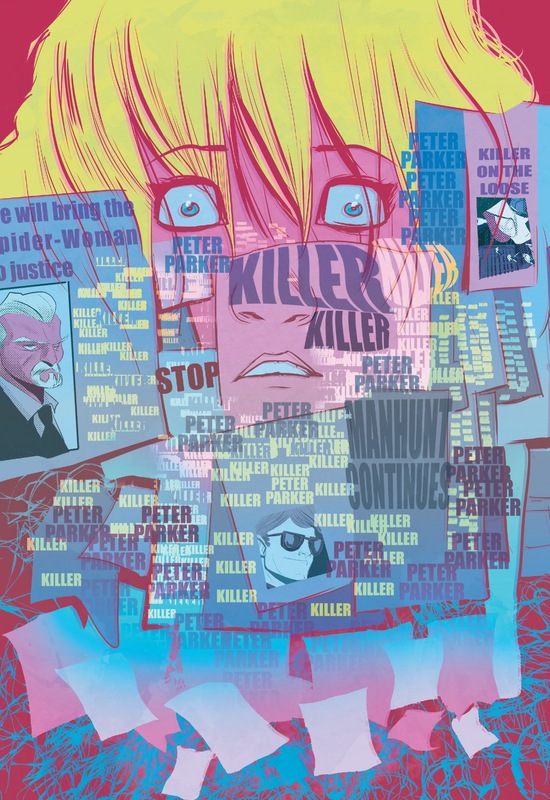 While I’m still undoubtedly a fan of what Jason Latour and Robbi Rodriguez have created in Spider-Gwen, after this most recent issue I’m finally starting to understand why there are some people out there that are a tad frustrated with this series. That’s not necessarily a concession that I agree with them, but it is an acknowledgement that perhaps there are some a few more fundamental flaws with Spider-Gwen than I was initially willing to admit. Of course, anyone who’s been a regular reader of Chasing Amazing the past four-plus years realizes that as a writer myself that my critical eye has a tendency to focus a little too much on the script — especially as it relates to how the author is developing the comic’s cast of characters. I know that this bias unjustly ignores a vital part of comic book storytelling — that it’s a visual medium that relies on a harmonious marriage of solid scripting and dynamic illustrations. But I’m a sucker for a well-crafted character-centric story. Sue me. All the same, I think when you look at some of my all-time favorite Spider-Man stories — “The Master Planner Trilogy,” “Kraven’s Last Hunt” and “Nothing Can Stop the Juggernaut” — all of these arcs feature this harmonious mix of art and story/character. When I pick up these comics, I don’t even think of the story and art as being separate components because these arcs wouldn’t have achieved such legendary status if one of these elements was lacking in some way. 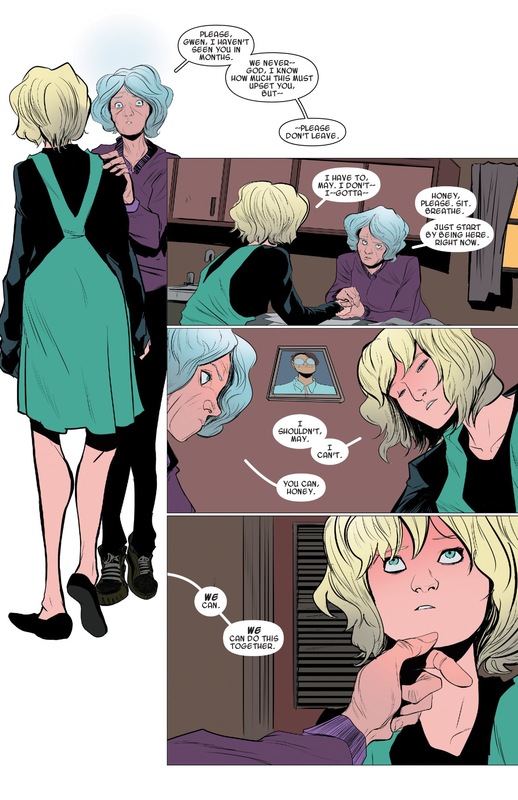 I look at a comic like Spider-Gwen #4, which addresses the aftermath of Gwen’s showdown with the Vulture and later Frank Castle at her father’s home, and I see an issue with some wonderful character moments — especially in the scenes where Gwen is chatting with this alternative universe’s version of Uncle Ben and Aunt May about the death of Peter. But I also see a comic that lacks visual dynamism. This is going to sound contradictory, but I don’t mean this critique as a slight against Rodriguez, or Spider-Gwen’s excellent colorist, Rico Renzi. 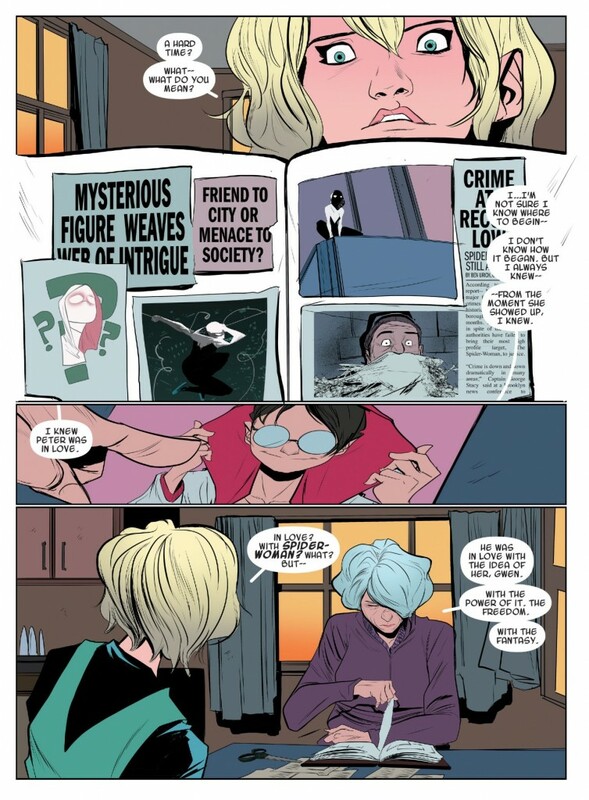 In fact, there are a few spreads — like one of Gwen’s face overlayed with anti-Spider-Woman headlines from the Daily Bugle — that I think are among the very best the artistic team have put forward in this series. And yet this comic comes across as being very low energy and placid in its pacing. It’s filled with quiet intimate moments, and yet that quietness and intimacy are never truly conveyed in a way that excites me as a comic book reader. As a character study, I thought it was great stuff, but as something that’s supposed to be representative of the superhero comic book medium, I’m not sure if it passes muster. If I remove my rose-colored glasses for this series for a moment and look back at the three other preceding Spider-Gwen issues, I think that each installment suffers from a similar predicament. Now, I think a lot of this can be defended by the fact that Latour and Rodriguez are doing some heavy lifting in creating a wholly unique alternative universe that is populated with fresh characters — not just analogues of characters we’ve already read about in dozens of other stories. 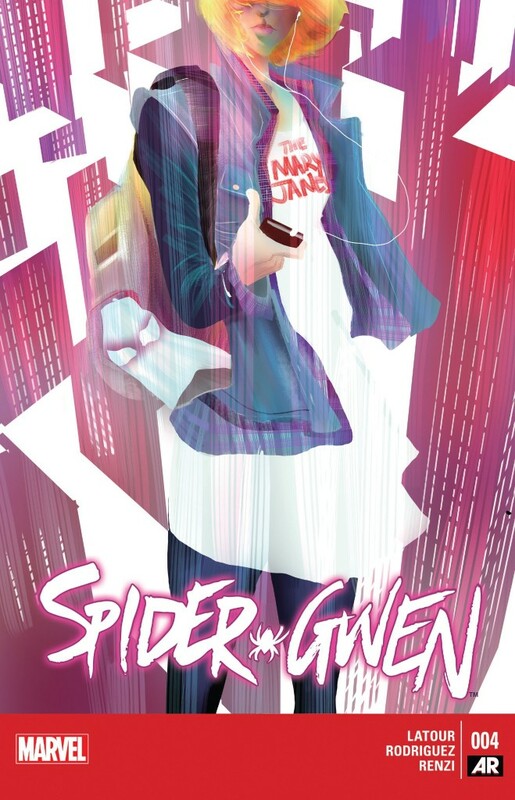 But after four issues, Spider-Gwen also seems to lack flow and an comprehensive arc. A steady stream of rich character moments do not make for a compelling narrative, regardless of how much I might like reading these sequences in the moment. The flipside of this style of storytelling seems to be the past year of the all story, no character bombast of Dan Slott’s Amazing Spider-Man. I’m in no way advocating for Latour and Rodriguez to go this route. But perhaps something like Gerry Conway’s “Spiral” arc could be a better template to follow. As I recently mentioned with that series, Conway has put together a script where the character’s actions and sensibilities are driving the action. And while the story is filled with great character moments, they don’t have a tendency of driving the narrative to a halt. 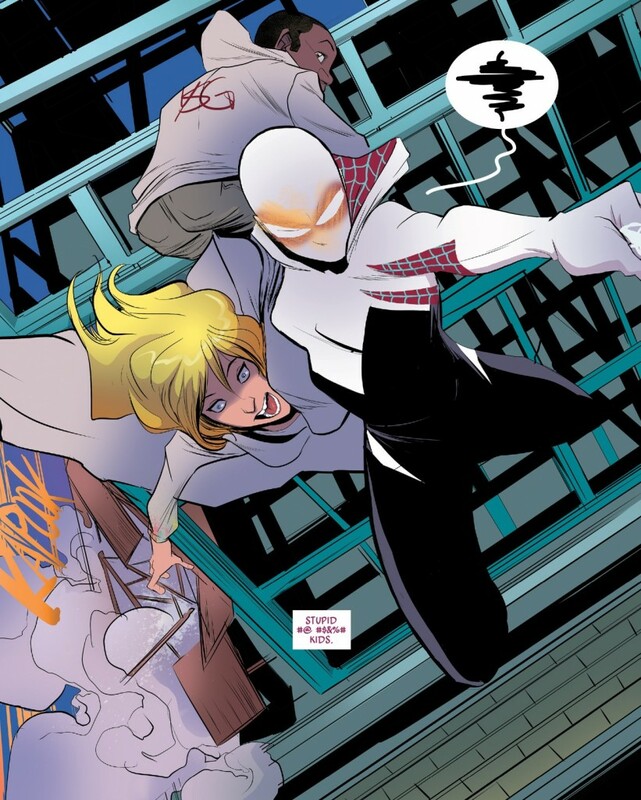 I still maintain that Spider-Gwen is one of the better comics coming out of the Spider-office right now, but I’m not longer throwing my hands in the air when I hear someone complaining about its pacing or lack of story. If anything, I just think this comic could be that much better once Latour and Rodriguez move past the setup phase and just get into telling the story they want to tell.